The 2008 contracted production of snap (green) beans in major snap (green) bean-producing states was 769,760 tons. Of this total, Wisconsin led all states (293,200 tons). The common green bean has been cultivated in Mexico for at least 7,000 years. I heard that green beans should be cooked through and never eaten raw. They are unhealthy that way. Is this just a myth or true? Thank you for a prompt answer. Green Beans are perfectly safe to eat raw - they have been eaten raw for many centuries. However, there are other beans that should not be eaten raw. Lima Beans are green in color, but they are not the same as 'Green Beans' (String Beans, etc.). Some countries, especially in Asia include all beans that are green into one group and warn against eating them raw. Lima beans contain cyanide compounds, which is why many countries, including the U.S., restrict commercially grown varieties to those with very low cyanogen levels. 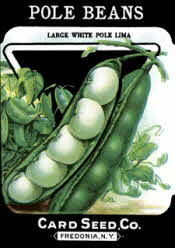 The lima beans grown in Java and Burma have 20 to 30 times the concentration allowed in most Western countries. They must be cooked thoroughly to allow the hydrogen cyanide gas produced to be driven off.